Can you see the light? If you dive within the light zone of a cave–the area near the cave entrance where natural light is always visible–you’re in the cavern zone. The fun part is exploring secrets hidden in caverns around the world and having the knowledge and skills to do it correctly. It’s an unforgettable experience which offers certified recreational divers the opportunity to safely experience the wonders of this underwater world, his subtle variety and astounding beauty! All the equipment you will need is included in your course. You’ll use all the basic scuba gear including a mask, snorkel and fins, a buoyancy compensating device (BCD) that also carries your scuba tank, a scuba regulator to breathe from, a weight system, a wetsuit, and instrumentation to monitor depth and air supply. The Cavern Diver course offers certified recreational divers the opportunity to safely experience the wonders of the underwater cavern areas. The Peak performance buoyancy course will help you perfect your buoyancy skills for cavern diving. Many cavern and cave divers are also Enriched Air Nitrox certified so that they can enjoy more time exploring underwater. – all dives are within no decompression limits. 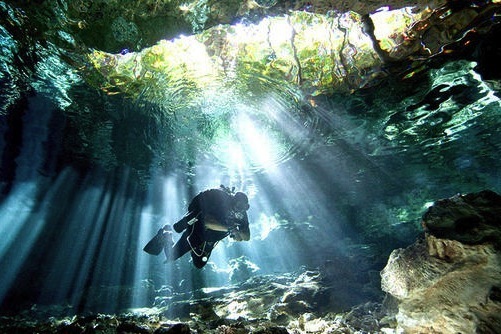 An underwater cave is an overhead environment beyond one or more of the above limitations. Further training is required before you can safely entering the cave area. Click here if you wish to know more about becoming a cave diver. Your swimsuit, towel, diving credential, liability and medical release forms. PADI Cavern Diver certification fee. We know that things can happen before or when on vacations. We are 100% honest with our refund and cancellation policy. Please read our Terms & Conditions before you book.